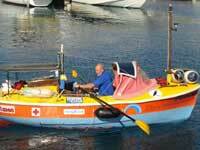 Wednesday 20th December 2006 8.00am Graham departs La Gomera harbour and sets out across the Atlantic. Unfortunately after only 8 hours Grahams journey comes to an abrupt end. Spanish coast guards stopped and searched The Puffin and finding some equipment not complying with regulations, put her under arrest and towed her back to La Gomera. Following a similar incident with the Russian oarsman at the weekend the story is there seems to be a clampdown by the authorities on orders from Madrid. Nobody knows the reasoning behind these actions. The local authorities are demanding a bail of 30,000 euros to release the boat, apparently they intend to impose a heavy fine when they decide what the charges are. More news to follow in 2 days.